Training foals and young horses. Introducing long-reins and early lateral work. Backing and riding young horses. Lungeing over poles and fences. Advanced long-reining including cantering, rein-back, shoulder-in, travers, half pirouettes, half pass, renvers, canter half pass, canter pirouettes and tempi flying changes. The latest edition of Lungeing and Long-Reining is a step-by-step guide to training, exercising and suppling horses from the ground, written by Britain’s leading exponent of the art. 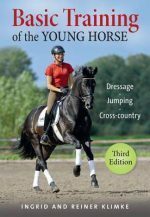 Published in association with the BHS the book begins with advice on handling untrained youngsters and works through a logical training progression, culminating in advanced dressage movements. Illustrated with specially commissioned sequence photographs, this book will prove particularly valuable in the early training of young horses, as well as in improving or retraining older horses, and refining dressage movements in advance horses. Jennie Loriston-Clarke MBE FBHS is one of Britain s leading dressage riders and trainers. She has represented Great Britain in four Olympic Games: Munich (1972) and Montreal (1976) with Kadett, Los Angeles (1984) with Prince Consort, and Seoul (1988) with Dutch Gold (14th). She also won the World Bronze medal in 1978 and was sixth in the Alternative Olympics in 1980, riding Dutch Courage, whom she trained from a three-year old. Jennie has enjoyed a long and successful career with horses, having bred and shown prize-winning ponies, hacks and hunters, as well as having ridden show-jumpers, point-to-pointers and eventers before specialising in dressage. Jennie is a Fellow of the British Horse Society, holds the National Pony Society Diploma and is an examiner for both societies. She is a well-known judge of show horses, a List 1 dressage judge and a highly respected trainer.